Ridgeway Radio is the radio station for Dorset County Hospital. Never before has the station had a breakfast show- until now! 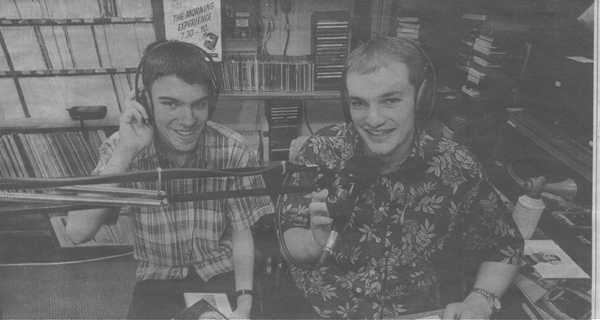 The Morning Experience has been 'on air for the last three months and it is hosted by Carl Greenham, with his sidekick, Matthew Pitman. The dynamic duo present the programme on Monday, Wednesday and Fridaymornings between 7.30 and 10.00 am. The show provides the patients of Dorset County Hospital with a mixture of music and mad-cap features making the show a new dimension for hospital radio. "I feel that the stereotypical image of hospital radio is broken with our show ", says Carl, " although we do have obvious limits because of the nature of our broadcasting." The shows can be described as fast-paced and full of fun. "Our opinion on radio is that if you can't have a laugh while actually doing the programme then they isn't any point in doing it at all." says Carl. Matthew continues, "Listeners can tell when you are genuinely enjoying presenting the programme and we hope that our listeners do have a laugh while they are listening to us. We aim to cheer the patients up." 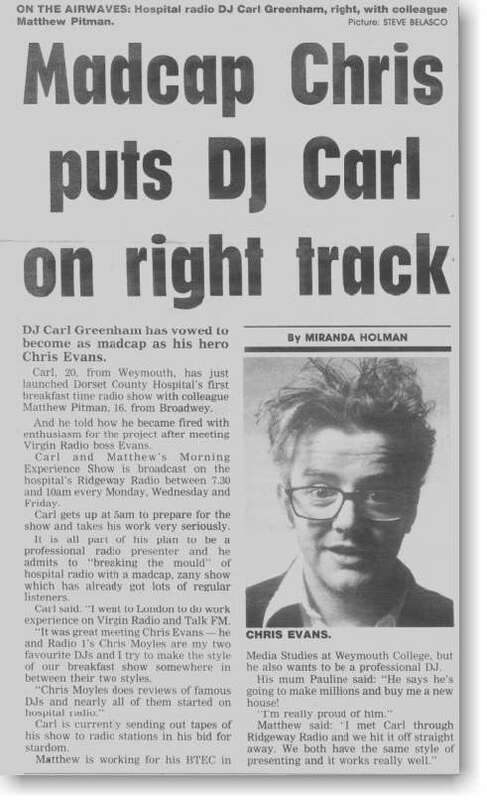 Carl in the past has spent a month at Virgin Radio with Chris Evans. He has also presented the breakfast show at Dorset Coast FM so he is used to the early mornings although Matthew isn't! "Getting up at 5.50am can be a bind but I love doing the show so much it's worth it!" said Matthew, "We both feel the industry is expanding with the introduction of digital radio and hospital radio is the best place to start." Carl and Matthew, both influenced by Chris Evans, hope to pursue a career in radio. Matthew is currently on a media course at Weymouth College which Carl completed last year. Another first for the station was a full days programming on Christmas Day. Carl and Matthew were up early to present a special Morning Experience." We presented the programme live from 7.30am on Christmas Day", stated Carl. "It was a great way to kick off Christmas!" "Hopefully the station will be applying for an AM frequency which means we can broadcast to more people within the hospital wards. Ridgeway Radio is really taking shape with almost a full days programming schedule each day."